Your fishing license does a lot more than allow you to fish. Why would someone need to buy a fishing license? The fish aren’t driving anywhere. It just doesn’t make sense. If you’ve ever found yourself grumbling over the fact that you have to buy a fishing license, read on. As it turns out, fishing licenses actually help protect and improve the sport you love. In the early days of America, the land was so vast and the people so few that it seemed like America’s wildlife populations would never run out. People simply took their fishing poles to lakes and streams and caught as many fish as they could. Back then, fishing wasn’t just a sport. It was a way to feed a hungry family. But as America’s population grew, the strain on our natural resources did too. There simply wasn’t enough game and fish to go around. It’s a tale as old as time – when human populations increase, wildlife populations decrease. To stave off the annihilation of species and ecological disaster, conservationists like President Theodore Roosevelt pushed for measures to protect wildlife populations – such as hunting and fishing licenses. What exactly does a fishing license do? A fishing license establishes that you are legally allowed to fish and gives limits to how many and what type of fish you’re allowed to catch at any given time, as well as other regulations. How does a fishing license protect fish populations? It limits the amount of fish that can be caught to prevent overfishing. It directs the time of year certain species of fish can be caught so anglers do less damage to populations who may be, for example, spawning. It limits the amount of anglers who can fish during a year to prevent overfishing. It feeds money from license fees into conservation projects, research, and fisheries that keep fish populations healthy. Anyone caught fishing without a license is subject to hefty fines, which also generate revenue. 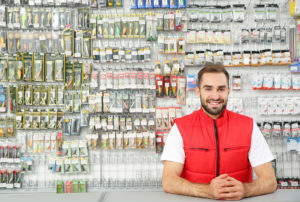 You can buy a fishing license at most outdoor sports stores and bait shops. Also, you can buy a license online from the U.S. Fish and Wildlife service or your state’s Department of Natural Resources website.